Labor Day is upon us and with it the unofficial end of summer. Which never really made sense to me, these self-imposed ends of vacations, but I don’t make the rules here. This week we’ve got The Visit, The Perfect Guy and 90 Minutes in Heaven. As if old people needed even more of a bad name in our society, along comes a movie that surely sets the AARP lobby back a few years. Visiting grandparents can be a massive chore. They’re old, creaky, set in their ways, complain all the time about "this new generation." It’s bad enough without them beings possessed homicidal maniacs intent on killing their grandchildren. 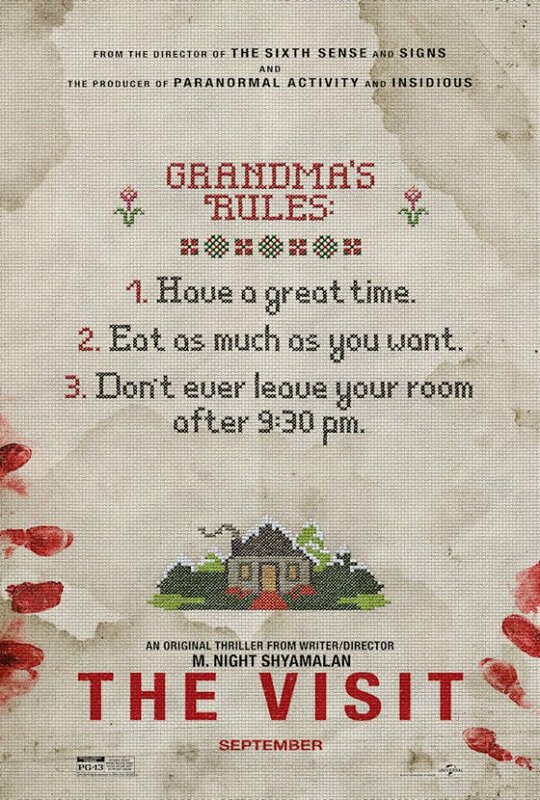 Thanks a lot, M. Night Shyamalan. My man M. Night has had what many would consider a pretty bad decade. After coming out of the gates relatively strong, dude’s spent the last ten years making movies like Lady in the Water (24%), The Happening (17%), The Last Airbender (6%), and After Earth (11%). That’s as terrible a run as you can expect to see out of anyone still getting funding and backing to make Hollywood movie. And it isn’t like these films are poorly-reviewed cult classics or anything like that. No, they’re just bad, nearly unwatchable films. The guy fell from the mountaintop pretty damn hard and it’s really a shame after an early solid run with Sixth Sense, Unbreakable and Signs. Now he’s back with a Labor Day release about an ill-fated trip to grandma and grandpa’s house. I’ll applaud him for a couple of things in his newest movie. One, it takes an extra set of balls (or just a last ditch effort at making something good) for a guy to make Gram and Pa the antagonists (possessed homicidal maniacs to boot) in a film. This, in and of itself, is at least an interesting take. Two, I found the trailer decidedly tense and scary. In fact, I’m typing this with an extra knot in my chest from the part where grandma invites the kid to get into the oven. If the film can maintain the intensity of the trailer then there’s a good chance M. Night’s not completely dead in the water. He doesn’t have the benefit of the doubt anymore. Those days are long since over. But it wasn’t an accident M. Night Shyamalan made really cool movies to start his career. At least at one point he had a knack for building suspense and bringing the coup de grace twist at the end. The Visit could get him back there. 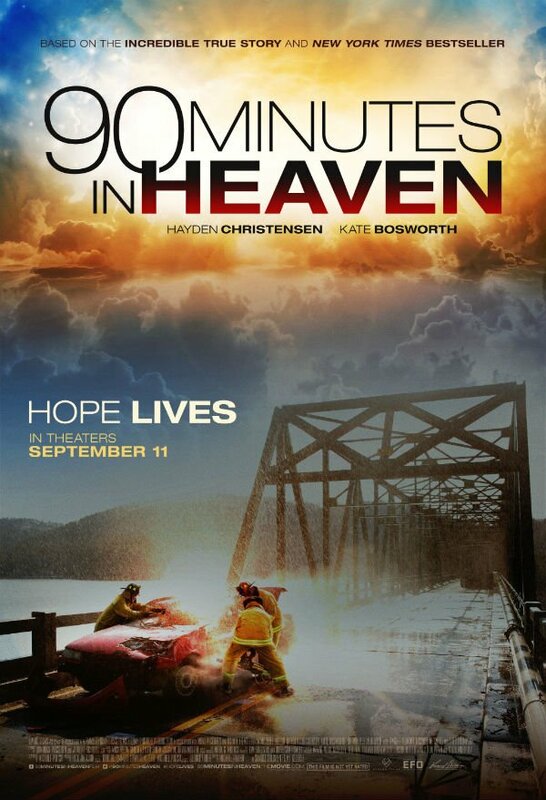 Wasn’t 90 Minutes In Heaven the name of a game we all played in middle school? Sure, maybe you only played it for seven minutes at a time, but I typically liked to start up a conversation, talk about hopes and fears, wax poetic on the state of current events and eventually, after much discussion, smooch just a bit. That kind of thing takes an hour and half. Ah, to be young again. This movie is made by Christians, for Christians. I’m not saying that in a derogatory way in the slightest, just laying out the clear agenda. It’s made by Giving Films, which is branded together with Family Christian Stores. The title is super clear in what it’s doing. Guy gets smashed in a car accident, dies, goes to Heaven, wakes up, hates life until everyone prays and he doesn’t hate life anymore. And that’s pretty much it. I doubt there’s anything in the movie that isn’t in the trailer. In fact, I feel like I watched the whole movie in two and a half minutes. If the plot arc is supposed to leave you wondering about his mental state or whether he "comes back from this," fear not. He does. It’s right there at the end of the trailer. I’m not sure what else is left for the movie except extended scenes of people praying for him. This movie will appear to a certain population and many others will have no idea the thing even got made. I suppose that can be said for many films, but seems especially true for the subset of Christian films that exist out there. They do good business among their built in base while not even registering on many other radars. The cast is strong enough and I bet it has it’s touching moments. But it all looks too corny for me, and critics (even if they get out to the theaters to see it) won’t find much to sink their teeth into. When I first read the title of this movie I got a little pissed in what I thought was an unauthorized account of my life, but that was shot down pretty quickly. Even beyond that, though, The Perfect Guy’s title is purposefully misleading. This dude doesn’t seem perfect at all. In fact, he appears to be the exact opposite. I see what you did there moviemakers. Kudos. 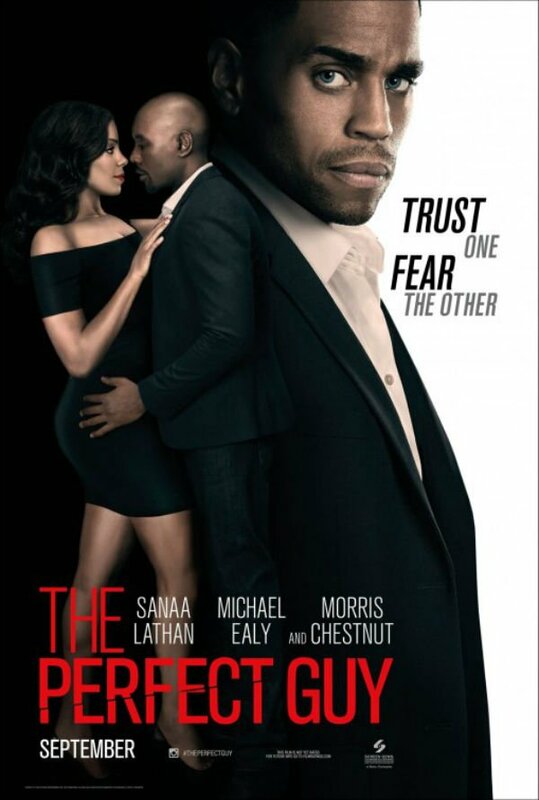 The Perfect Guy details the struggle of a beautiful woman as she navigates the dating waters with two handsome guys - one psychotic, the other not really crazy at all. That she wants to take a break from the nicer guy at first only to fall head over heels with the psycho is the story of the flick. Michael Ealy goes through the nice guy-turned-murderous stalker beats like clockwork. He’s the boyfriend of the year in the early going, only to slowly devolve into the kind of guy who can’t take "No" for an answer. This is the first wide release film for David M. Rosenthal, though he does have some smaller releases in Janie Jones (52%) and Single Shot (48%). I suspect this latest film falls very much in the same critical category, though possibly a bit lower. To begin, I can’t imagine this film treads any new ground in the stalker genre, unless Morris Chestnut ends up being the bad guy’s brother or something and they are in on the scares together. Short of that, I think this one plays very much by the same script we’ve seen many a time over. This isn’t to say movies like this are bad. They can be entertaining enough. But to really score well with critics you often need to bring something new to the table (think The Gift from earlier in the summer). Other than that expect a finish in the middle or below. I had a hit and a miss last time around. I wanted Transporter Refueled (Predicted: 44% Actual: 18%) to be good. It looked slick and flashy in all the right ways from the trailer and I thought critics might go in with the right frame of mind about an end of summer action flick. And they very well might have, but the end results just weren’t there. Some liked it fine enough for what it was, while others just couldn’t get past the nonsensical nature of the plot and some terrible dialogue. Cinema Blend’s Mike Reyes tried to help the Rotten Cause with his review. He gave it three and half stars, which is basically as high as a movie like this could ever hope to get. That counts as high praise for this kind of flick. Meanwhile A Walk in the Woods (Predicted: 50% Actual: 47%) was a near direct hit. I missed by only three percentage points. The film adaptation of the popular Bill Bryson book just couldn’t sustain a 90 minute run time about a couple of over-the-hill dudes hiking the Appalachian Trail. CB’s Gregory Wakeman summed up the critical consensus pretty well in his review saying you’d need to be "quite a cynic to really hate A Walk In The Woods, even at its most mundane and tepid…" This kind of faux-apologetic take on the flick was pretty much the rule among the critical crowd. Next time time around things start getting really slow with Black Mass, Captive and Maze Runner: The Scorch Trials. It’s gonna be a Rotten Week!